The Polished Concrete specialists are pleased to announce our involvement with the refurbishment of the main lobby of the Hoxton Hotel in Shoreditch. Self described as an urban playground for the young at heart, the hotel's style epitomises contemporary chic with 210 innovatively designed bedrooms. We have contributed with a seamless Pandomo Loft polished concrete floor to the main reception area. Work took place over the course of two weeks, working alongside other specialists trades. 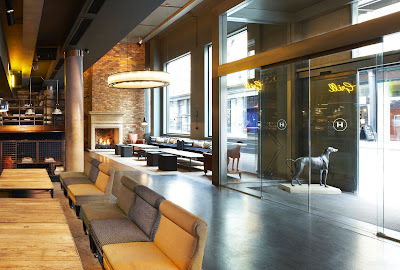 We are delighted with the finish and encourage you to go and see our work for yourselves, whilst of course making fantastic use of the Hoxton's superb amenities.